Correction in the amount of rep gained is 75, not 750... As I have been friendly needing 6000 to honored. I have completed 2 Leylines, and am only at 1100, not the 1500 that is claimed to be the amount just from the Leylines. There's a quicker backdoor entrance at 20.38, 50.34. Next to the river. Requires 250 Ancient mana to activate....upon return to Shal' Aran, Arcanist Thalyssra will show up with a quest increasing your Ancient Mana cap by another 200 and getting another 75 rep towards the Nightfallen faction. To find this one (which gives credit for "Falanar North" in Ostentação do meridiano), enter the tunnels by jumping down at 20.1, 41.8 (maybe need a kite or something) and then take the entrance at 55.7, 44.4 (the entrance with Prolemadre Shu'malis). The Leyline Feed is right next to her. 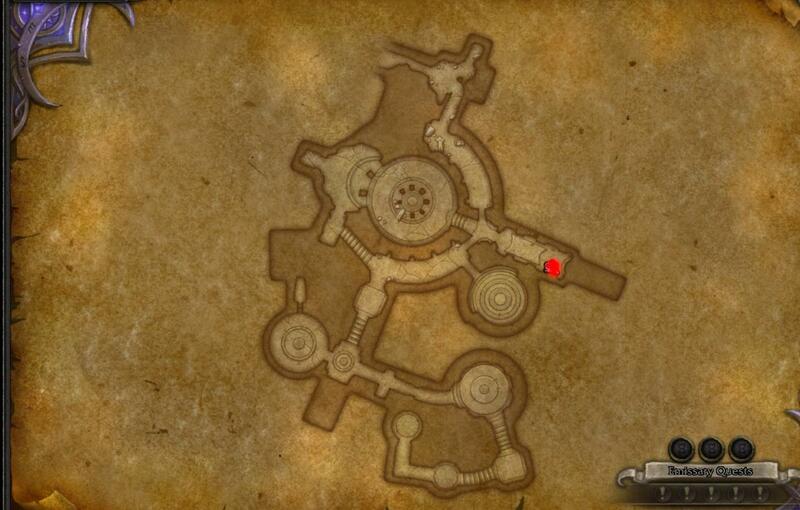 This one is located deeply in Falanaar temple, where also Broodmother Shu'malis located. There is an entrance to the temple in point 22.9 35.9, get down the stairs, pass through first room and turn left at next stairs down, pass through a break in a wall and pass through a room with a crystal. There will be another break in the ground, get there and you will enter in Falanaar Tunnels.There is a tunnel with dead end from central room heading to east. There you'll find a leyline. Also be sure you have 250 ancient mana to activate it. I don't know why the location of the objective is a big secret - nobody seems to want to give its coordinates. Infunda a Fonte do Meridiano em Mana Ancestral.